Legacy of the Force: Tempest on kolmas romaani Legacy of the Force -kirjasarjassa. Sen on kirjoittanut Troy Denning ja se ilmestyi syksyllä 2006. Kirjan tapahtumat sijoittuvat viikon päähän kirjan Legacy of the Force: Bloodlines-tapahtumista. Ääniversion on kertonut Marc Thompson. Kirjan kansikuvassa on Tenel Ka Djo. Forty years after the Battle of Yavin a dangerous new era in the Star Wars epic begins–the revelations are shocking, the stakes desperate, and the enemy everywhere. As civil war threatens the unity of the Galactic Alliance, Han and Leia Solo have enraged their families and the Jedi by joining the Corellian insurgents. But the Solos draw the line when they discover the Corellian's plot to make the Hapan Consortium an ally - which rests upon Hapan nobles murdering their pro-Alliance queen and her daughter. Yet the Solos' selfless determination to save the queen cannot dispel the inescapable consequences of their actions that will pit mother against son and brother against sister in the battles ahead. 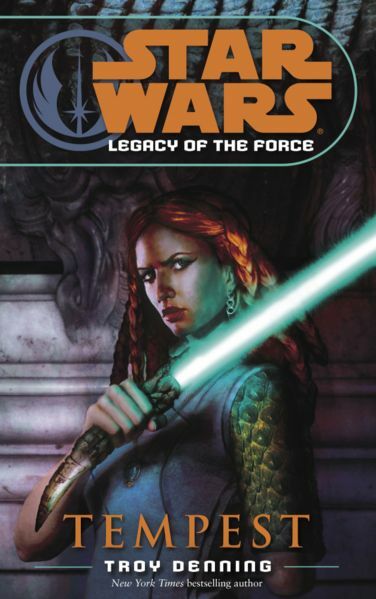 For as Jacen Solo's dark powers grow stronger under Dark Lady Lumiya, and his influence over Ben Skywalker becomes more insidious, Luke's concern for his nephew forces him into a life-and-death struggle against his fiercest foe, and Han and Leia Solo find themselves at the mercy of their deadliest enemy. . . their son. Sivua on viimeksi muutettu 23. heinäkuuta 2018 kello 20.34.